A really easy-to-make meal tonight based on a recipe from Rick Bayless’s Mexican Everyday. Halibut sits on a bed of sliced potatoes and carrots and is baked in a quick tomato-jalapeño salsa. I love recipes like this; they’re so adaptable to whatever fish or vegetables you’re in the mood for, are very healthy, and are on the table in under an hour. Well it is pretty spicy… and by the way, this is the best halibut ever. Oooh, yeah, I think I timed it perfectly — it’s just starting to flake and is incredibly moist. Well, we’re getting twice the veggies since all I did was use less fish than called for in 4-serving original recipe. I like that we’re once again proving that we [heart] cilantro. Turn on the oven to 400 degrees. Place the potoatoes and carrots into an 8″ square glass baking dish and drizzle over the oil and 1/2 tsp of salt. Toss to coat, then spread the potatoes in an even layer, cover with plastic wrap, and microwave on high for 4 minutes, until the potatoes are just tender. Meanwhile, in a blender combine the tomatoes in their juices, garlic, cilantro, jalapeños, and pickling juice and puree, leaving just a little texture. 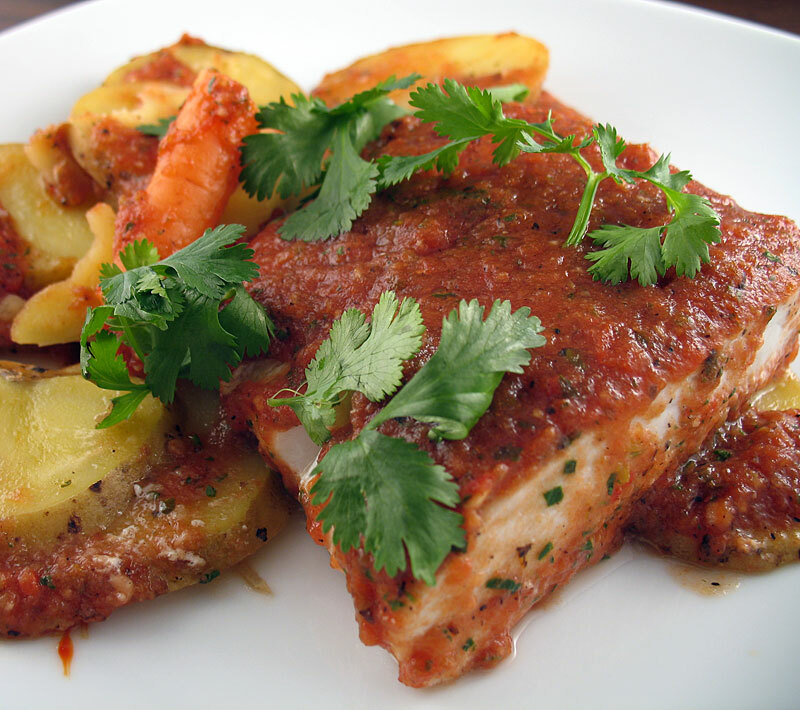 Lay the fish in a single layer over the potatoes and pour the tomato mixture evenly over the fish and potatoes. Slide the baking dish into the oven and bake for 15-20 minutes, until the fish flakes when pressed firmly.